When Sabotage asked me if I’d like to review a poetry slam, I had some reservations. My taste in literature runs out at around 1918, so I only had the vaguest idea what slam poetry was. I had images of being put on the spot by people who knew ten times more about the subject than I did, or being exposed as a fraud and frogmarched out of the RADA foyer bar by beret-wearing bouncers who understood postmodernism. I even took notes on a few articles about performance poetry, presumably in case there was some sort of test. When I reached the venue, though, I was very quickly put at my ease. People were friendly (even before I mentioned I was here as a reviewer) and more than happy to explain how things worked. There was definitely a real sense of community here; one that seemed happy to welcome newcomers into the fold. The first half of the show started with a tribute to Fran Landesman, nominated posthumously for Best Overall Performance/Reading, and I would encourage readers to look up the work of this highly talented lyricist. A smooth and uplifting performance from Sarah Moore, with Miles Davis Landesman accompanying. Throughout the awards, which had been decided by online ballot, we were also treated to a number of non-competitive performances by nominees and winners. Highlights included Nia Barge‘s highly charismatic deconstruction of the beauty myth, and Kemi Taiwo‘s flawless verbal barrage of anti-war protest, but these were by far not the only strong performances of the evening. I only wish I had the time and space to talk about them all. Best Performance by a UK Poet: Mark Niel from Milton Keynes, who encouraged the audience to “live every day like you just had your first kiss”, a polished performance showing a great deal of vocal versatility. Best Performance by a performer working in English and another language: Susana Medina, with translator Rosie Marteau. Best Performance by a London Poet: Keith Jay Jarrett. Best SLAM! Performance: Amy Acre, delivered to rapturous applause. Her performance of Blackbird, a highly sensual poem of sexual fluidity and self-doubt, did a lot to explain why she seemed to be a crowd favourite. Best Farrago Debut Feature Performance: Amy McAllister. This Irish poet had a deceptively underwhelming stage presence; her visceral, earthy and fluent performance was one of the highlights of my evening. Best Performance by a performer using spoken word, comedy or music: Miles Davis Landesman & ensemble. This was followed by a performance by Miles accompanying singer Kath Best. An enjoyable tribute. I would love to hear Kath singing from a more soulful repertoire, as it is clear this would suit her voice immensely. Best Performance by an International poet: Penny Ashton (New Zealand), who sadly couldn’t be here tonight, due to the trains from New Zealand being delayed that evening. Best Overall Performance/Reading: Fran Landesman, awarded posthumously for a performance at Farrago only days after the death of her husband. One poet remarked that it was “the most courageous performance [they] had ever seen”. The second half of the evening kicked off with performances by the hypnotic-voiced Abraham Gibson and UK Slam Champion Harry Baker. If I still had lingering fears about slam being inaccessible to me, then Harry Baker‘s love poem about dinosaurs put them solidly to rest. With his strong geeky charisma and his talent for seamlessly combining rap influences with maths jokes, it is clear that this performer will go far. It soon became clear that since I was neither performing in the slam, nor friends with anyone in the slam, nor “in a sordid sexual relationship with anyone in the slam” (I am not kidding, this was one of the criteria), I was one of the few people eligible to judge. I applaud this attempt at objectivity, although it was somewhat negated by the tendency of the audience to boo when lower-than-average scores were given. When this happens on X factor, I throw stuff at the screen, but I didn’t think that response would be appropriate here. Still, whilst perhaps meant in good humour, it is never conducive to a fair competition. To the MC John Paul O’Neil‘s credit, the whole process was explained clearly, so even as a complete newcomer to slam I was able to pick it up very quickly. However, I did notice that the scores were perhaps more disparate than they should have been, which I learnt afterwards is a common phenomenon at slam events. This should probably have been explained to us on the night in order to avoid “score creep” (the process by which judges award higher scores as they have more fun and drinks – ed). Highlights of the slam included Katrina Quinn, with a breathless and highly evocative performance that showed a lot of potential; Kathleen Stavert, whose fluent and conversational style made me want to hear more, and Lettie McKie, a first-time performer who delivered a highly promising ode to chefs, although her choice of subject matter didn’t grab me. The winner, by .1 of a point, was Anthony Fairweather with an energetic and well-delivered image of the Olympics gone wrong. Anthony obviously has a great deal of potential as a comedy poet, and had the audience laughing a number of times. In retrospect, digs at “the health and safety brigade” are a little old even for this Victorian scholar, but that is my only real criticism. A well-deserved victory. I have to confess, I expected to cringe a lot more than I did. My experiences of non-performance poetry groups and writers’ circles have occasionally been just short of traumatic. However, this was far from the case at Farrago. Although there were some weak performances, all of them had at least one positive aspect, and I even found myself awarding perfect tens to two separate poets. There were fourteen participants in total, all of varying abilities. Although previous Sabotage reviews have criticised this aspect of Farrago slams, I think it has the advantage of making the slam seem accessible and welcoming to newcomers whilst still being entertaining for non-participants. Perhaps more experienced poets and performers might need to supplement their circuit with more selective events, but there is a definite sense of inclusion and community here, and I would definitely like to come back and attend in a non-reviewing capacity. 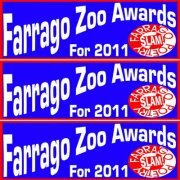 Conclusion: Any kind of intra-community “award ceremony” always risks being elitist, but the Farrago Zoo New Year Slam Awards successfully managed to avoid this. A highly enjoyable and accessible event. Clearly Farrago’s diversity is one of its strengths. 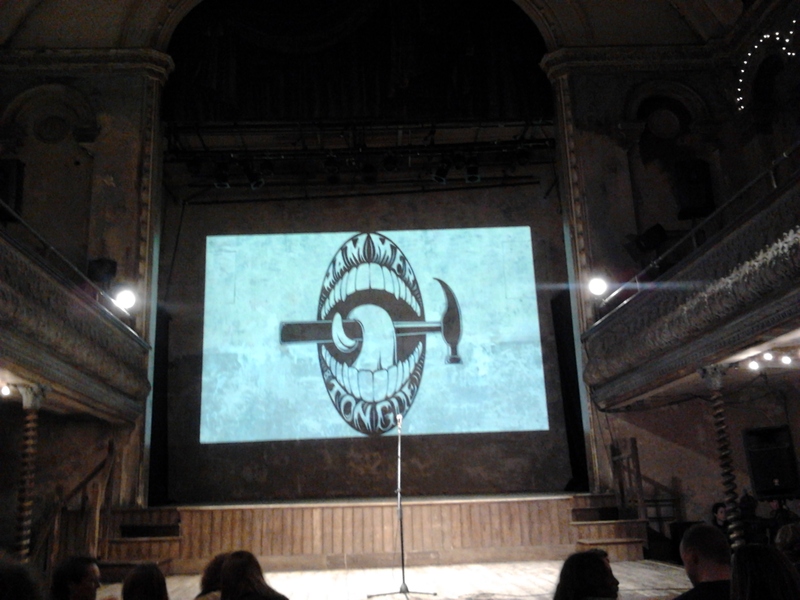 This was my third time at Sage and Time, and the last event of the year, and that sense of community, supportiveness and general good humour that makes this event so special was very much in evidence, with poets referencing each other and the event itself in their pieces, and plenty of laughs throughout the night. Hosting duties were split between accomplished poets Richard Marsh and Anna Le (both members of the Dirty Hands poetry collective), and the obvious friendship and sense of fun between these two set the tone for a relaxed and welcoming night. Richard Marsh kicked the night off with a sweet, whimsical tale of two misfits who find love at the gym. His characters were touchingly relatable and vividly rendered by a fluid, engaging delivery. As a host, he’s charming, always taking the time to compliment and engage with each performance, picking out a line he likes, or making a friendly joke. Anna Le hosted the second half, and as always I was struck by the obvious passion with which she introduces performers. Her introductions are both a rousing welcome, and a great anticipation-builder. She performed a piece of her own called “Spine”, which I loved, an exploration of courage, fear and determination animated by a mesmerising delivery that used dynamics and careful pacing to great effect. Stephanie Dogfoot’s ‘Equus’ was a wonderful expression of sisterly love and support. It had its share of serious, grown-up emotional content, but masterfully set against the surreal backdrop of childhood –the bizarre worlds that people who have grown up together create, complete with burnt teddybears and clown phobias. Through this lens of shared imaginings she made the serious, adult crisis at the heart of the poem achingly poignant: A surreal exploration of the intense, enduring, and weird nature of sibling love. The Janice in question was Janice Windle, whose own pieces were imbued with an elegant, conversational delivery. One of them was a companion piece to Donall’s, which declared, “I’m in love with your mandible, darling” which concluded an affectionate exchange. Among James Webster’s pieces was an unexpectedly touching musing on his ideal superpower. He would choose to be “quietly super”, with the power to find lost things, especially people. Acknowledging that he wouldn’t be able to take them home, he’d be glad, at least, to “give them someone to talk to”. Amy Acre’s gorgeously life-affirming “love poem to the sea” was one of my favourites. “As old men talk to their dogs”, she talks to the sea, and the sea both sets her free and inspires her to love of all the messy wonder of life; from dandelions and dragonflies to the delight of Sage and Time itself. It was intensely sensual and personal; proclaiming the “red earth” as her church, she let us glimpse her relationship with the world. And did so with a graceful, inspiring passion that made me want to run to the nearest beach, take my clothes off and dance around naked in the sea. During Keith Jarrett’s inspiring performance of ‘Parting Words’ I had to work to keep my tearducts from boiling over into undignified spillage. Masterful use of repetition and assonance gave the piece a mesmerising, mantra-like quality, while his quietly determined delivery complemented his perfectly measured pacing. A resolutely optimistic self-reminder to not be defined or limited by one’s postcode, by one’s past, or one’s fear of the future – something I’m sure most of us need from time to time. Keith Jarrett is awesome. The first featured poet of the night was Sh’maya, an engaging performer whose first piece was a meditation on ancestry, history and loneliness developed from the image of a tap-dancing boy on city streets, rendered with a passionate, electrifying delivery and skilfully imbued with a sense of urgency and movement. Sh’maya’s second poem was about a quest to find the most beautiful word in the world. His protagonist imagined travelling around the world, meeting different people who suggested different words with special meaning to them and their lives. Full of potential, but the poem was seriously hobbled by the cliché-riddled depictions of some of the characters, which often verged on patronising stereotype. The worst offender was a depiction which verged on romanticising suffering: a childless woman standing on a Kenyan beach looking yearningly out to sea, clinging to the hope of a child, proclaiming the most beautiful word to be ‘yearn’. As if she (and therefore, the poet) were revelling in her misery. The problem was not the attempt to give a voice to diverse characters, but that they did not sound like real people with real ugly and beautiful life experiences, rather, magical props placed where they were for the sole purpose of providing Sh’maya’s protagonist with a story (and in the woman’s case, a means of transport). This was intensely problematic. The second featured act, Anthony Joseph, was new to me. And he blew me away. Joseph read pieces from his collection Bird Head Son, “an autobiography in verse”, and a few more from his latest, Rubber Orchestras. His poems ranged from touching character portraits, memories of childhood and experimental jazz-poetry, to musings on family heritage and history against the backdrop of colonialism. A prose excerpt about a future colony of Afro-Caribbean people on an alien planet, from his novel The African Origins of UFO, was infused with vivid detail that brought to life the Caribbean cultural roots of the community while retaining the extra-terrestrial, futuristic strangeness of the setting (where exist such wonders as “surrealist butter”). His startling, inventive use of language, vibrant musical delivery and persistently brilliant animation of memory, place and history were a constant delight. Anthony Joseph (the crowning moment of the night for me) talked about the need for poetry to be more than flat words on a page, to be alive and affecting, and like all good poetry events, this night of Sage and Timey goodness was full of that. Brisk-moving waves of poets inviting the room into their worlds. While not every performer was as compelling as Anthony, the night was still packed with strong, inventive voices (not all of whom I could mention here sadly) and by the end of it I was filled up with poetry – with language, ideas and glimpses into people’s personal universes, their senses of humour, their stories, the inside of their brains and hearts and marrow. A fitting finale to Sage and Time’s 2011.